What started as a simple Yuurei Randomizer has become a whole lot more. 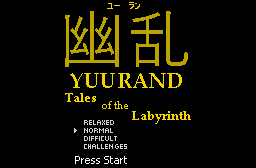 Introducing Yuurand: Tales of the Labyrinth, a new randomizer quest featuring the best of the old with tons of new content! Explore a brand new Labyrinth with unique twists on old themes to collect a huge inventory of original spells, without a single vanilla ZC weapon in sight! 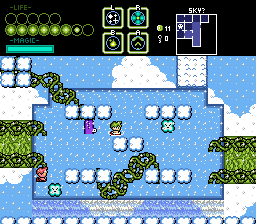 Along with the spells from Hitodama and Yuurei, you can find tremendously powerful spells hidden away in the 8 secret bonus levels. The original Yuurei may have boasted "more playable characters than any other quest," but with over 40 characters, Yuurand has blown that record away! 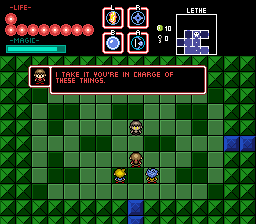 In addition, each character has their own signature spell and passive skills, allowing for a wide range of different play styles. Try all of your favorites from the new character select menu to allow for a replayable adventure in which no two runs are the same. 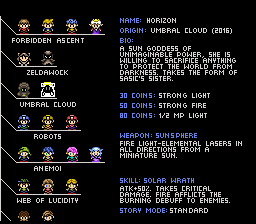 Many character groups also have original stories and subscreen skits, too! Can you guide your group through their foes to unravel the Labyrinth's secrets and confront the mysterious puppetmaster behind it all? But if playing one character at a time isn't enough for you, Yuurand includes a cooperative 2 player mode! Via the same machine locally or online over Parsec, you can play with a full featured partner who retains their spell upgrades, signature weapon, and certain skills. Team up and coordinate your attacks to dish out maximum damage! Yuurand: Tales of the Labyrinth will be releasing Sunday, May 13th. We've put a lot of time, love, and hard work into this project, and we hope you all will look forward to it. Q: I never played Yuurei, how does X feature work? A: In general, I'd suggest playing Yuurei first, as this game has spoilers for it everywhere. But if you don't wanna start with Yuurei, here are the most confusing mechanics from Yuurei, explained. - To clear a run, the boss at the center of Venter Mortis must be cleared. If story mode is turned off, you can fight it as soon as you can reach it, but it will be extremely powerful. Killing the other six bosses will weaken it, so it is highly recommended to take them out before attempting the fight. - Often times, items are hidden behind blocks. These can be broken by shooting them with any primary (sound, wind, or magic stream). There are hints for most of these; look for weird patterns in the wall or the like. - Some blocks must be hit with a particular spell to break. The spell required can be seen by firing a charged sound wave at them, or casting thunder. - As you collect coins, you will gain defenses for various elements. Getting hit from the front by an element you have a defense for will deal no damage. - If a leech attaches to you, move around in all directions rapidly to shake it off. - Don't swim in the frozen waters of Lac D'Amour before finding a way to warm them. - We'd advise you start with the "Yuurei" Labyrinth, as the new "Yuurand" Labyrinth builds on concepts introduced there and is generally more challenging. It's somewhat comparable to Zelda's 2nd Quest. Q: What balance changes have occurred since Yuurei and the original Yuurei Randomizer? We've rebalanced several spells. The most notable instances follow. - Because people complained that sound wave was the clear best primary, Wind now deals 2.5 damage (compared to 2 for uncharged sound) and has longer range. - Similarly, magic stream has been buffed, beginning at 2 damage and gradually increasing to 4 max as the button is held. It also drains less magic and has a shorter cooldown. - Light magic now deals direct damage (completely ignoring enemy invincibility frames), making its high fire rate actually useful now. - Poison can be cast on any screens, not just screens with enemies. 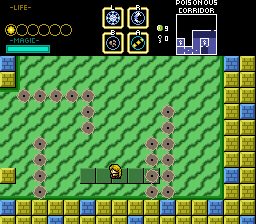 Its effects carry over from screen to screen for the duration of the poison timer, making it more useful outside of boss rooms. - Thunder and death both have cooldowns now, to prevent spamming at the expense of all other spells. - Fire is no longer resisted by most bosses. - To compensate, meteor storm's damage is reduced to 2 in boss fights (it still does normal damage outside of boss rooms). - Flake shield no longer consumes magic over time, simply having a one-time activation cost. It also no longer blocks projectiles, as this made it arguably less useful. - Nightwaves no longer heals unless being cast by Sasic. 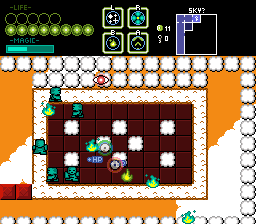 Additionally, several enemies and bosses have been modified. The most notable instances follow. - Dark elementals fire more slowly on normal and relaxed. 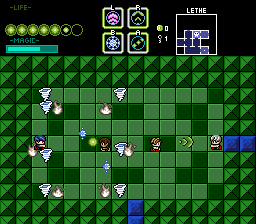 - Laser elementals are now properly configured as light-type enemies in regards to defenses. - Sand crocs have been completely rescripted. They should now always be properly knocked back underground and should no longer be ridiculously challenging to dodge when moving in certain directions. However, they will now attempt to wiggle around corners to reach you. - Floating witchrobes are now more aggressive and less likely to flail about back and forth in solid walls, as default ZC wizzrobes are oft to do. - Fake-o-lanterns are slightly faster. - Rhone's spears are much easier to dodge. - Seine's wind moves more slowly. - Caelan's flake shield is slower to expand. - "Reflecto McMirror" no longer uses his mirror shields, and his skull barrier's radius is tighter. - "Lighty McShooty" is now a bit less teleport-crazy. - Tier 2 Rhone is fought in a larger arena. - Tier 2 Seine no longer overlaps his wind walls on difficult. - Tier 2 Horizon's splitting shot spread is much less tightly packed. - Tier 2 Jack and Will fights have both been buffed. - The upgrade "Floor damage null" has been removed, as there are now several more active methods for negating floor damage. - The upgrade "Half damage" has been replaced with "3/4 damage". 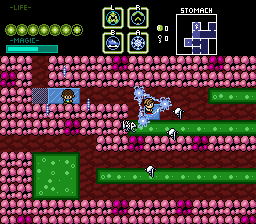 To compensate, more heart containers have been hidden, resulting in the same effective maximum HP at game end. Q: I'm confused, what does this item do? A: Here's an explanation for the more confusing items. - Sound Wave: This spell can be charged by holding down the button. - Magic Stream: This item deals more damage the longer its held, but also consumes more MP. - Light Arrow: This spell ignores enemy invincibility frames, meaning you can rapid fire it to strike enemies much more often than with other spells. - Petal Shield: This item will absorb any projectiles you have a defense for, and can absorb fireballs with no defenses. It will never absorb boss projectiles, however. - Enhance: This spell increases the range and/or damage of most spells in your inventory for thirty seconds. Casting it a second time will result in a speed boost. - Conduit: This spell's type is determined by the last coin you picked up. After collecting all 100 coins, you can switch its type using the machine in Venter Mortis, directly south of the boss room. - Ingrain: This item will heal you based off the number of enemies on screen. It is affected by Petal Shield's upgrades. Q: Okay, but what does this character's signature or passive ability do? A: Here's an explanation for the more confusing signature items and passive abilities (or the confusing aspects of them). Wisps: While using Flame Form, you are invincible. Jack and Hito can damage enemies by touching them. Will and Hito will regain HP by simply being in Flame Form. Naiya: Bubble Shield decreases the damage taken for the next two hits. 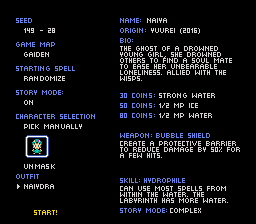 Additionally, the entire Labyrinth is edited to have more water when playing as her, to capitalize off her ability to cast spells from within the water. AOE spells (such as thunder and quake) cannot be cast from the water. Emily: Homing Bow operates similarly to Sound Wave, with two key differences: The projectile is light type, and it will home in on enemies. It receives boosts from light upgrades, and the upgrade "Free Charge Shot" will cause it to fire normal shots for free, and charged shots for reduced MP. Flect: Simply hitting an enemy with Sound, Wind, or Magic Stream will poison them. This is a separate poison from both the poison inflicted with the poison spell and the poison dealt by poison field. 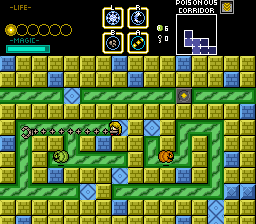 You can stack three different poison types on enemies! To compensate though, her primaries don't deal much damage at all. Horizon: When using Sunphere, you are not invulnerable at the start or end of the attack. Look for the color change to indicate when you are invulnerable. "Evan McFrickwhy": Hold the attack to fire a projectile. Release to detonate it. Let it reach the screen edge to arc lightning between you and it. Quinn: While there isn't a visual indication, holding the button will catch ANY projectile that nears you. Release to throw them back. Ava: Tap a direction three times, then use the item to switch toolbits. 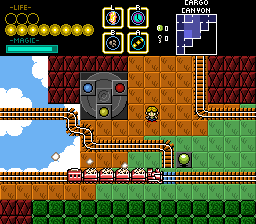 For example, pressing down three times then using the spell switches to drill. Her punch punch kick combo does direct damage on the first two attacks, then deals knockback on the third. If you get stuck with her grappling hook, hold up and down to return to the start of the screen. Gale: Hold the button for a few seconds to charge and fire three tornadoes. Hold it even longer to release five in a circle around you. Q: I unlocked some secret characters! How do I use them? A: Contact Russ or Aevin via PM or using spoiler tags on the forum, and we'll be happy to post some information. Please don't post character names in plain sight in public, and consider keeping the more difficult ones to unlock a secret entirely. Q: I ran into a boss in a random room. What gives? A: That would be a roaming boss! 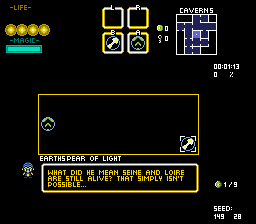 There's four in total, and one will spawn in each run, potentially in any area of the game. You don't have to beat them (unless they're blocking the way forward), but they're guaranteed to drop a spell. If you find them blocking your path early in the game, consider going around, if possible, taking a different path, or coming back with more upgrades. Q: I'm confused. I beat the boss of Venter Mortis, but my character said there's still a secret. Where do I go? Q: I want to play Multiplayer, but I don't have any friends to play with locally. How do I play online? A: You and your friend will both want to download a tool called Parsec. Install it, and configure your computer for sharing. You'll want to check your speed using Speedtest, and have whoever has the faster upload speed host. Please note, however, that hosting with Parsec requires Windows 8.1 or higher. If you're running Windows 7, you can still play over Pasrsec, but someone else must host. Add each other as friends in Parsec, then have the person who's not hosting ask to join the host's computer. The host will need to click the button to give the person keyboard access. Q: How do I actually turn on Multiplayer now? A: Multiplayer can be turned on from any warp point in the game. The closest warp points to the start are down and right in the "YuuRand" Labyrinth, or right two screens in the "Yuurei" Labyrinth. Step onto the warp point, then press the map key. Multiplayer can be enabled from here. Note: If you're playing story mode, Player 2 is limited to picking a character who appears in that story. Q: How does Multiplayer actually work? A: P2 moves using Ex 1, 2, 3, and 4 as Up, Down, Left, and Right. They'll also use L and R for firing spells. R, when used in the water, will dive. Both players must push along a screen edge for the screen to scroll. If one player gets stuck, they can hold left and right (P1) or Ex3 and 4 (P2's left and right buttons) for a few seconds to warp to the other player. Any spell buffs (such as enhance or float) or debuffs (such as slow or confused) apply to both players, regardless of who cast the spell/was hit by the projectile. P2 maintains their unique signature weapon (which can be equipped at the same time P1 has theirs equipped) and has their own weapon upgrades, which are displayed in a separate panel on the subscreen. P2 keeps their own passive ability for the most part, but passives that modify stats (such as speed or attack) do not apply; these stats are calculated based only on P1. Q: I picked a difficulty that was too easy or hard for me. Can I change it mid game? A: Of course! Access the options menu by going to a warp point, stepping on the center, then pressing the map button to reach the options screen. The difficulty can be changed from here. Q: Who has outfits and how can I change them? A: Characters with outfits include Naiya, Jandra, Tyre, Emily, Lucas, Caelan, Sasic, Mato, Miles, and one unlockable character. The outfit can be chosen at game start. If you want to change the outfit, simply access the options menu by going to a warp point, stepping on the center, then pressing the map button to reach the options screen. P2's outfit can be changed here as well, though please note that one of Miles's outfits cannot be worn by P2 due to palette limitations. Q: Where do the stories fit in Yuurei or another series's canon? A: The stories in Yuurand don't fit into the Yuurei canon and in some cases directly contradict it. They're best viewed as "alternate universe" or "what if" scenarios and most of them shouldn't be taken too seriously. The Web of Lucidity stories are canon for that series, minus any interactions with Yuurei characters, but that doesn't mean a lot until their quest gets made. Q: How much scripting went into this quest? A: A lot. The final count is 361 FFC scripts, with 118,457 lines of code, not counting modified headers. We truly believe it to be the most ambitious quest released, on a technical level at least. Q: I think I found a bug, is this supposed to happen? A: We've done our best to do a thorough testing of the quest. However, the nature of a randomizer with so many moving parts means that it's impossible to test every possible situation. If you find a bug or abnormal behaviour, please report it here and we'll do our best to fix it. If you run into any lag, please let us know what was happening during the lag and (preferably) your computer's specs. You guys should try the Total Eclipse challenge and Low% at the same time. It's a good, relaxing time. My god this has really expanded a lot since I last saw the randomiser ages ago. Really nice to see so many expansions have happened, it pretty much just became its own game really lol. I'm looking forward to playing this asap! Edited by Dimentio, 14 May 2018 - 03:13 AM. Implying we weren't still furiously fixing bugs last night at midnight. Anyways, Aevin and I are pleased to announce that Yuurand is released and can be downloaded from the quest database here! Be sure to grab the enhanced music! It may come as a surprise, but on the day of release, players are reporting some bugs! Most are non-essential, but we've made a few updates to the file. I'd suggest always making sure you're on the most current file before you play to avoid encountering rare but serious bugs. There's apparently been another update due to lock blocks not working correctly. Also, walking off of Russ cliffs Walking into clouds on Screen Transitions. Expect even more updates to come soon, because they are totally going to blow Quest 744 out of the water in updates total. Eppy you cannot out-bugfinder me. I literally found a watefall clip that allowed you to warp to the bloody sky. I found a way to make a tortured lost girl appear and talk in two places at the same time while being tortured. I managed to find a way to bring freaking ghosts back from the deader than dead to assist you with silly costumes. Stand down. You will never beat me. Come on guys, give us a break here ... The scope of the quest is huge, and it's natural that some bugs have slipped through in spite of our best efforts to test everything thoroughly. We even mentioned that in the FAQ. You're talking as if the quest is nothing but a bug-ridden mess, and that could deter new players, when it seems like you both have been enjoying it pretty thoroughly.. We're grateful for the ones both of you have spotted. But could we keep it constructive, and a bit less "let's laugh at those incompetent quest creators," please? No need to get offended. Anyway, I think rainy west wind feels very wrong and glitchy. It kind of goes into walls or flies off in weird directions and it doesnt help that its wavy. Believe it or not, it is coincidence. I've never played Life is Strange before. They're from a quest I'm currently working on where a central mechanic is entering a different, surreal world via dreaming. That was the feel I was going for with it, actually. Zephyr's personality is very laid back, preferring not to take things seriously. As a result, he can't even be bothered to make his projectiles behave in a coherent manner. Really digging this! I unfortunately don't have much to say as of right now. I discovered a few cool hidden things but I'm too absorbed into this that I'm almost at a loss for words. I respect the amount of work this probably took. I think finding bugs is forgivable given the magnitude and randomized nature of this quest, definitely not bug-ridden though. I hope to at least play every story and maybe give Gale another run eventually.